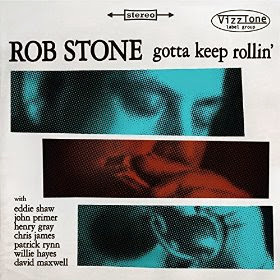 I just received the newest release (September 9, 2014), gotta keep rollin', from Rob Stone and it smells of sweet Chicago. Opening with a strong Chicago style blues, Wait Baby, Stone is out front singing and blowing his harp backed by Chris James on guitar. Cool harp work and solid guitar riffs over a solid beat provided by Patrick Rynn (bass) and and Willie Hayes (drums)provides for a great opener. John Lee Willamson's easy stepping Wonderful Time features nice piano work from David Maxwell and a different slice of Stones super vocal work. His harp work complimented by James on guitar makes for an happy go lucky track. Another Chicago style shuffle track, Lucky 13 gives Stone a wide road to play his harp and he takes every inch of it. Cool vocal phrasing, a tight guitar solo from John Primer and a cool melody makes for one of the most memorable tracks on the release. Anything Can Happen features Eddie Shaw on sax and he tears up the solo opportunity as you would absolutely expect. Very cool! Jazz Gillum's, She Belongs To Me, has a subtle easy pace lead by Frank Rossi on brushes giving Stone an easy cloud to sing and especially harp over. Billy Emerson's Move Baby Move, has a great swing and a ringing guitar solo rhythm throughout. James steps out nicely on guitar on this track but leaves room for the super Eddie Shaw to wind it up and blow it out. Very nice! Strollin' With Sasquatch is a very cool instrumental featuring Stone on harp, Ariyo on piano, Maxwell on piano, James on guitar, Rynn on bass and Hayes on drums. Smooth! Wired and Tired has that Muddy Waters jump feel. Featuring Henry Gray on a signature piano solo and Eddie Kobek on drums this track moves. Stone lays out some great harp riffs and James is ever ready on guitar. Super! Willie McTell's Cold Winter Day is a real down and dirty blues track featuring some of my favorite harp work on the release. Maxwell rolling in some really nice piano work and with hot guitar riffs from Primer not only in solo form but also under the melody this is another of my favorites on the release. Excellent! Cornelius Green's It's Easy When You Know How has a certain R&B feel featuring Maxwell on piano under the vocal and harp work of Stone. Having more of a pop feel, this track should have broad appeal. Blues Keep Rollin' On features cool vocal harmonies with Clarke Rigsby and a really infectious melody/rhythm. Not No More' is a great final track for this release with a driving drum rhythm from Hayes, tidy guitar riffs and solo work from James, super piano work from Maxwell, clever lead vocals from Stone, accentuating backing vocals by Mike Mahany and an overall good feeling. Very cool!